Complimentary email from the IMAX head of development which moved us forward with the studio. 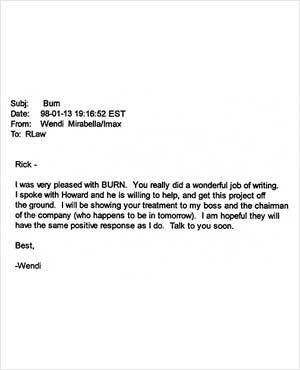 I initially developed BURN after MTV approached me inquiring if I would create an animated TV series for them. With that opportunity presenting itself, I desired to create a project, a series of stories that would shine some light through the darkness, yet at the same time appeal specifically to that audience. Thusly, BURN: a love story was born. It is a gothic styled fairy tale that has been compared to part Edward Scissorhands and part Beauty and the Beast (Disney�s version I would guess?). MTV eventually chose to pass on BURN, with some consolation in the way of amazing praise for the project and it�s vision, even offering me a development deal to come up with another project for them (which I chose to decline). However, after that point, because of MTV�s praise, virtually every studio in Hollywood expressed interest of some sort or another and we bounced all over trying to secure the project somewhere. BURN, it seemed, was gaining heat. During this time, I was pleased and honored that my friend and mentor, Emmy-award winning Producer Howard Kazanjian (Raiders of the Lost Ark, Return of the Jedi, and Demolition Man, among others) chose to attach himself to the project as producer. In the midst of this, the large format film company, IMAX, approached me with the idea of turning BURN into a feature film for them. I accepted the challenge and wrote a �prequel� of sorts to the events occurring in BURN: a love story, and titled it BURN: shadows and light. IMAX welcomed it with open arms, and green-lit the picture, with a small list of changes to the story that were requested for the following drafts. While we were concerned with how these changes were to be accomplished, we did agree to proceed. Within a week and a half, a number of leaks about the film project appeared on the internet, most of which focused on IMAX�s requested changes to BURN, and which highlighted our private concerns, seeming to then present IMAX in a negative light. Subsequently, IMAX�s chairman was made aware of these reports and quickly shut down the project. Afterward, inspired by the reporting, an online crusade of sorts grew out of these events with people constructing fan based websites while campaigning to IMAX, and the company�s Chairman, to reinstate BURN. In about a year�s time, the furor seemed to subside and the majority of websites have now disappeared completely or evolved to focus on some other purpose. Unfortunately, in spite of all the efforts and good intentions put forth, BURN has not been resurrected at IMAX. I was both humbled and surprised by this unexpected outpouring, if simply because so little of the elements that are BURN have been revealed yet. However, recently the Chairman of IMAX and I did exchange correspondence and the door has not been shut to perhaps pursue some project there again in the future, and I hope that may in fact happen. While currently, BURN has stalled with any forward progress, (in part because of the time being devoted to furthering some other projects), we continue to hope and desire that it will one day it will be realized.